You never know what you are going to find when you stalk someone online as I have been stalking Dr. William Aprill of Aprill Risk Consulting for the past few years. Aprill’s expertise is, in part, in understanding the psychology of violent criminal offenders and what law abiding citizens can do to make themselves safer in light of that understanding. To this end, he posts about violent incidents on his Instagram account, drawing lessons from them for his nearly 3,000 followers. 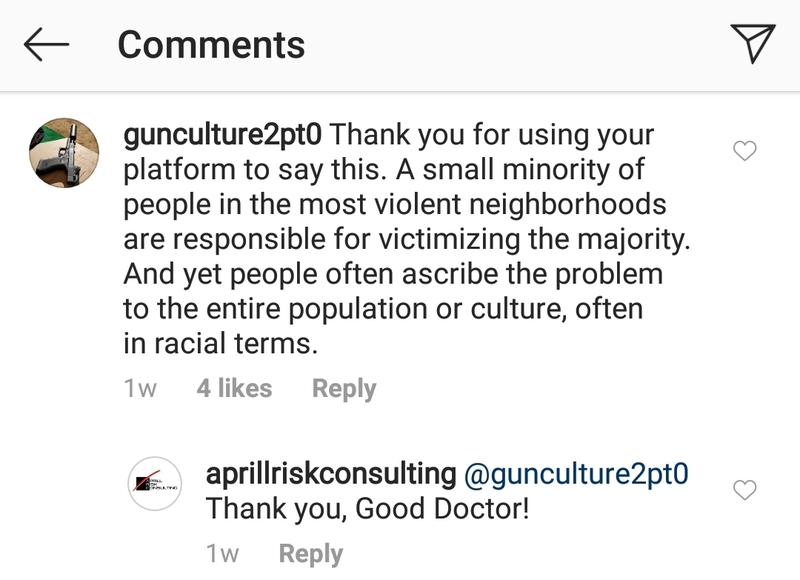 I was also very happy to see Dr. Aprill recently use this platform to make an important point about violence and violent victimization. 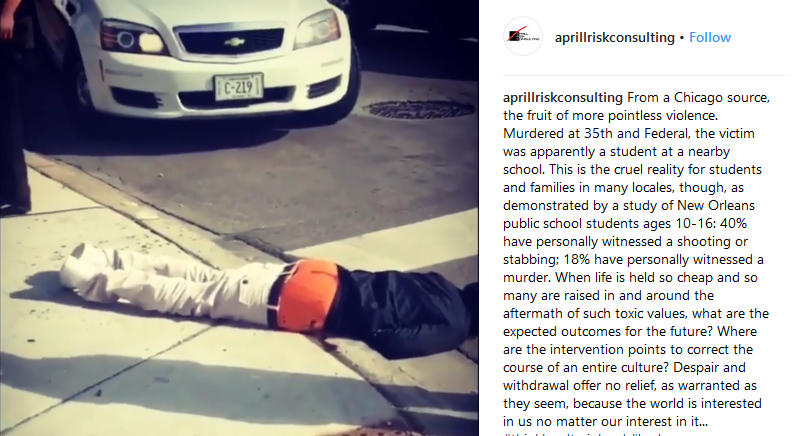 On October 1st, Aprill posted a video of a young man laying dead on a street corner in Chicago. Screen cap of @aprillriskconsulting Instagram feed. Words like “race”, already devoid of any real meaning, aren’t part of a productive discussion at this time. They’re just flashpoints. What we need to discuss are populations, and the cultures that arise out of them; defining and creating in an endless recursive loop. So let’s have the hard discussions but do our best to make it more likely for them to be productive. 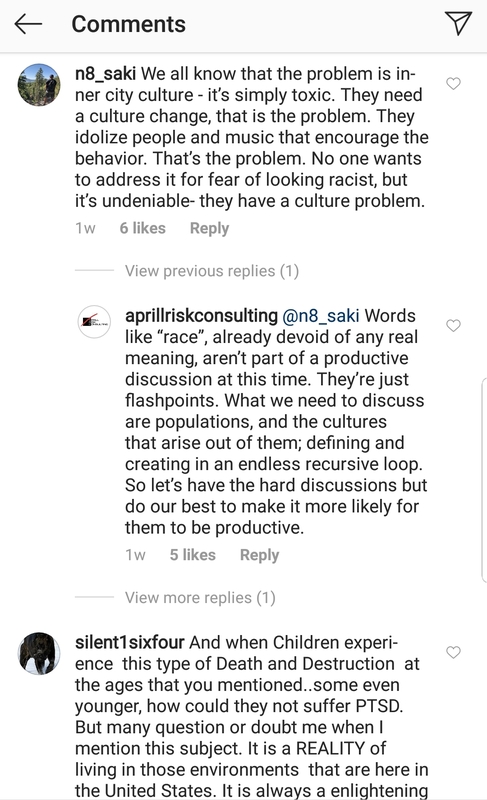 Screen cap from @aprillriskconsulting Instagram feed. Thank you for using your platform to say this. A small minority of people in the most violent neighborhoods are responsible for victimizing the majority. And yet people often ascribe the problem to the entire population or culture, often in racial terms. But we know from social scientific studies of concentrated gun violence — mocked and dismissed by some in gun culture — that the number of bad actors in any neighborhood is exceedingly small. This means the vast majority of people in those communities are innocent (often indirect, though sometimes direct) victims — the students and families Aprill mentions in his original post who have to live in this “cruel reality” of everyday violence. And when Children experience this type of Death and Destruction at the ages that you mentioned..some even younger, how could they not suffer PTSD. But many question or doubt me when I mention this subject. It is a REALITY of living in those environments that are here in the United States. This comment, too, is supported by social scientific research on the effects of violence on communities. 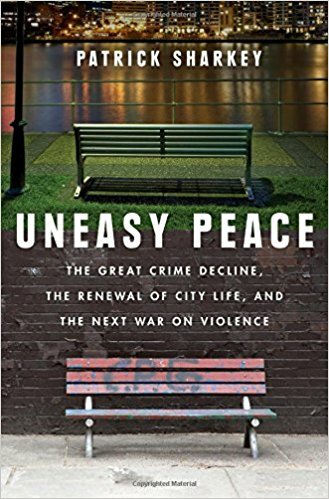 Sociologist Patrick Sharkey’s recently published book, Uneasy Peace, discusses the pernicious indirect effects of community violence on the daily lives of residents, and particularly the measurable negative effect on the educational achievement of schoolchildren who are neither perpetrators nor immediate victims of that violence. Whether we address this out of self-interest (as Aprill suggests) or humanitarian concern is of less importance than that we address it. Thank you, Dr. Aprill, for facilitating a hard but productive and non-racialized discussion of violence. Tags: Aprill Risk Consulting, Community Violence, guns and race, Patrick Sharkey, violence, William Aprill. Bookmark the permalink. Two recent senseless shootings, one in Espanola and one in Santa Fe, both by teens, brings this home. People are not born to be senseless murderers. They learn it somewhere. Interdicting that learning cycle seems more productive than shooting people and thus ensuring that the lessons of Maslow’s Handgun keep being learned. Good article. May I suggest reading “Values for a new Millennium”? It has some useful pieces to the puzzle. I have personally seen some hard evidence of the ideas discussed in the book at work on the Wind River Indian reservation. So yes, it is not just about “blacks”, and has everything to due with damaged cultures. I have not read it but will look for it. Thanks for the recommendation.